Considering the city's pricey reputation, you might be surprised by the sheer number of things to do in Hong Kong on a budget. And budget doesn't mean bad. Whether it's taking a ride across the harbor in a traditional junk or watching a free light and laser show amidst the skyscrapers, the best sights in Hong Kong are often for free or cost just a few pennies. Blasting lasers and spotlights onto more than 40 skyscrapers on the Hong Kong waterfront, the Symphony of Lights is one of Hong Kong’s most impressive attractions. Stand on the Tsim Sha Tsui waterfront as the 10-minute show lights up the incredible Hong Kong skyline. The show takes place each night at 8 p.m. and is completely free. Gambling is part of Hong Kong's DNA, and the races at the famous Happy Valley racecourse are the ultimate shrine to the city’s addiction. The racetrack itself is a jaw-dropping spectacle: It's set right in the heart of the city, flanked by a wall of skyscrapers. This makes for an exciting backdrop during the regular Wednesday night meetings. Inside, thousands of screaming punters urge on the horses, while expats drink from jugs of Heineken and dig into trackside hot dogs. The cost of entry is just HK$10. Hong Kong has one of the richest movie histories in the world. From the bad guy beatings doled out by Bruce Lee to hard-boiled triads with John Woo and the romantic dramas of Wong Kar Wai, Hong Kong knows how to produce a hit. Down at the Hong Kong Film Archive, you'll be introduced to these hits and movie history with regular free film screenings, talks by prominent directors and other exhibitions. 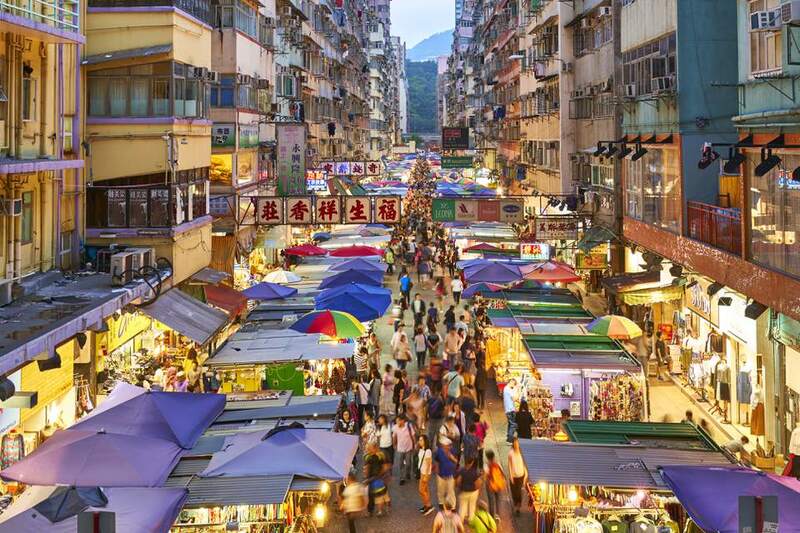 Hong Kong’s markets are a thriving tradition in the city, and many Hong Kongers continue to shop at their local market for everything from the latest piece of electronic gadgetry to a freshly-plucked chicken. Even if you’re not interested in splashing your cash around, the markets are bursting with life, filled with bright colors and the clatter of Cantonese bargaining. These bat-winged boats were once one of Hong Kong’s signature symbols until they were superseded by fast ferries and large fishing trawlers. One of the handful of vessels remaining is the Duk Ling, a traditional junk from the 1930s. Take a step back into history with a one-hour sailing cruise across the harbor in the Duk Ling. Tickets cost HK$230 (about $29, as of 2018) and include a free drink. Hong Kong’s most prominent museum, and arguably its best, is the Hong Kong Heritage Museum, which traces the region's history from the T-Rex to the British. Aside from the usual displays of glass-cased fossils and dusty pottery, the museum also boasts an engaging mix of interactive exhibitions and multimedia presentations. Entry is only HK$10 (about $1.25, as of 2018), and is free on Wednesdays. Hong Kong may seem like a temple to capitalism and money-making, but the majority of its residents remain remarkably religious. There is no better way to see this traditional streak than at the hundreds of temples that dot the territory, some of which are more than 100 years old. The temples are filled with statues to various deities, thick with the smoke from large incense coils and littered with oranges, chocolates and take away noodles—all offerings to the gods. Hong Kong’s iconic double-decker trams are the city’s answer to London’s red buses or New York’s yellow taxis. Winding through the heart of Central and Causeway Bay, the trams pass through the city’s busiest streets and take in some of its key sights. Take a seat on the top deck and watch the bustling streets below. Hong Kong has a fearsome reputation for emptying your wallet in return for filling up your belly. It doesn’t have to be that way. Dai Pai Dongs are Hong Kong's ​street-side kitchens, offering basic, but tasty food for little more than the change in your pocket. Their streetside seating also makes for an ideal people watching location. Famous for its skyscrapers and shopping, Hong Kong’s great big and great green backyard is often overlooked, as are its superb beaches. Hong Kong is made up of over 300 islands, meaning there are endless stretches of golden sands, from clean resort beaches to unspoiled coves and bays. While you may want to give the occasionally murky water a miss, the clean sands, ample BBQ pits, and ease of access make the city’s beaches a great way to spend a day away from the big smoke. Hong Kong is a city of diversity. From its very beginnings as a British colonial outpost, the city saw Indians, Pakistanis, and Australians arrive on its shores as policemen, army recruits and traders. The city is still a thriving mix of nationalities, and this is no better seen than at the infamous Chungking Mansions. Voted as the best example of globalization in Asia by Time, this building was once riddled with crime but today is a maze of cheap phone shops, hostels, and bargain Indian and Pakistani restaurants. Not for the faint of heart, but this is the best way to get a picture of Hong Kong underneath all the skyscrapers and shopping malls. You'll have to stump up for the ferry ride, but once you are there Macau's casinos are full of incredible sights that won't cost you a penny. You'll find Qing-era vases at the Wynn Macau, gondolas cruising the canals at the Venetian Macau and virtual mermaids at the City of Dreams.